Just about any conventional tackle angler has at one time tried a piece of hardware for either salmon or steelhead. Perhaps the most simple of the terminal tackle used by anglers, it may very well be the hardest to master. Although an old favorite of Bob's for steelhead fishing, rarely do we spend an entire trip tossing spinners or spoons unless specifically requested by a customer. In this section, we will take a look at fishing the various types of hardware for both salmon and steelhead and briefly touch upon the pros and cons of fishing hardware. 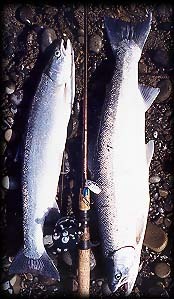 A pair of Bogachiel winter-run steelhead caught on a Blue Fox Spinner. Perhaps the most familiar of all artificial lures. Spinners, when used in the right manner are an excellent way to entice strikes from both the salmon and steelhead finning the waters of any Pacific coast stream. They come many different shapes, sizes, and colors, and many of the choices work quite well; however, as is the case with most types of terminal tackle, the biggest influencing factor is not what you use but rather how you use it. Most people have trouble catching fish on spinners for one reason: they are not able to keep the lure near the bottom, a must for consistent success. On the other hand, spinners give anglers an opportunity to effectively fish pocket water and very slow moving areas with sometimes very good results. The key is presentation, and we'll help you a little with that. 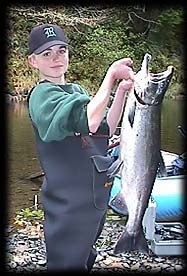 Below, we'll break our spinner fishing discussion into two parts: one for salmon fishing; one for steelhead fishing. Choosing a Spinner ... the choice of spinner to use for steelhead fishing varies widely with the water conditions that an angler will encounter. For summer-run fish in warmer, clearer water flows, a smaller spinner is likely the best choice ... sizes 1 to 3 are very popular with 4's a good choice when some weight is needed or fishing heavy water in which you'll find many of the summer runs. For winter runs, 4's and 5's are far and away the most common size choices with the smaller spinners making an occasional appearance. Finishes vary a lot too. For the low clear water of summer, brass blades are very popular and black finished spinners are an excellent choice (see our tip on blackening brass spinners). In the winter, the brighter finishes of nickel, silver, and gold are most popular. These brighter finishes are often paired with brightly colored painted bodies to give the lure more visibility that is often needed to entice strikes in the higher, dirtier winter flows. The picture on the right shows some of our favorite spinners. Some are commercial products, others are ones that we build ourselves. An example of some spinners that work equally well for salmon and steelhead. Keep in mind that there is no such thing as the 'only lure to use'. When selecting selecting a spinner for steelhead fishing, there are a couple of things to look for: first of all, weight ... the biggest problem with fishing spinners is keeping them down in the strike zone of the fish (that means on or near bottom in most cases) ... choose the heavier weighted spinners for steelhead fishing, especially in winter flows. The second thing that you should look at are the finish types. 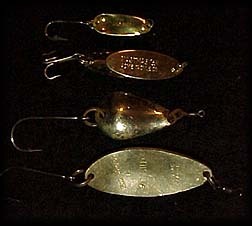 A little known quality of brass or nickel blades is their poor underwater reflective ability, in the case of both these finishes, they lose much of their reflective quality just a few feet underwater, this is okay when fishing cleaner water, but if you are looking for something to 'wake those fish up', you'll need to select spinner finishes of real gold or silver for maximum flash underwater. While gold blades are hard to find in a finished commercial product, they are readily available from component retailers. Silver plated finishes are easier to find right on the shelves of the tackle store, Mepps and Blue Fox products are both available in silver-plated finishes. Fishing the spinner ... while spin casting equipment is often associated with spinner fishing, we still prefer traditional baitcasting equipment for spinner fishing with the exception of those times when very light spinners are used. Why? Because traditional levelwinds offer greater casting accuracy and the ability to freespool line when needed. Although there are a few occasions when a cast and steady retrieve is your best option, in most cases, spinners are most effective in a cast and swing presentation like you would use in driftfishing. Because the spinner will want to lift towards the surface near the tail end of the swing, it is best to choose a piece of water that has a slower flow at the end of the drift in order to keep the spinner down in the strike zone. Or, if feasible, feed out small amounts of line to counteract the spinner's lift and help keep it down on the bottom. The diagram below gives a rough idea of the steps in fishing a spinner. Remember, that you don't need the blade spinning at a furious rate to be effective, as long as the blade is working, the lure will be effective ... other than initially reeling in the slack at the beginning of a cast to keep a tight line to the spinner, reel only enough to keep the blade moving and creating enough lift with the turning blade to keep the lure from hanging on bottom. A good rule of thumb in spinner fishing is to incorporate no or a very slow retrieve in fast water and use slightly faster retrieves in slower water. Your goal is to present the spinner to a fish as slow as possible in most instances. Although some of your strikes will be hard, others will not; in fact, sometimes it will seem as if your spinner simply caught bottom. If this occurs, simply lift on rod and if you feel any sort of tug back ... strike hard and fast!!! Spinners are used more often for salmon as many salmon will hold in very slow moving water that is very effectively fished with a spinner. Salmon also have a greater tendency to move to hit a spinner than steelhead ... especially silvers (or coho). Spinner sizes usually range from 3's to 6's with 4's being our favorite in most instances. Finish / color combinations are still a matter of personal preference, however our long time favorites are red body / silver blade and chartreuse body / 24k gold blade. Smaller spinners are sometimes used in very low, clear water conditions with some success, however, we have found a couple of other 'secret weapons' to use in these conditions with a little better success. Tossing a black spinner in very clear water paid dividends for this young angler. Despite the fact that you are often fishing deeper water for salmon than steelhead, weight is not as critical in your spinner choice as the water is often much slower moving and you are nearly always trying to achieve a slow retrieve, even in the slow water. Fishing the spinner ... spinner fishing for salmon can be done as diagrammed above for steelhead when fishing water with some current flow. Many salmon though, especially silvers, are found in the softer water and a 'swing' method won't work as there isn't enough current to move the spinner and get the blade turning on its own. When fishing these slow water area, make your cast, finish with the rod tip at the water's surface, allow the spinner to sink to the bottom and then lift the rod tip a couple of feet and start a slow, erratic retrieve. You may even find it helpful to 'jig' the rod tip a little and even stop your retrieve momentarily during the retrieve ... these abrupt changes in spinner motion can often trigger a strike from a following salmon. Perhaps one of salmon fishing's most exciting moment is the swirl of a big hook-nose nipping at your spinner just inches from your rod tip. If you see one following up to the point, make sure you execute some form of a direction change of the spinner. Often times it might just get him to bite right before your very eyes! The most popular of all salmon lures in Alaska, spoons have never really gathered a large following from either steelhead or salmon anglers in Washington, although Canadian anglers use them a great deal for both types of fish. Spoons are perhaps the most popular in some areas due to their ease of rigging and effectiveness in a wider variety of water conditions than their hardware cousin, the spinner. They can be 'swung' through moving water and retrieved through slow flows. However, despite this versatility, most anglers simply cast and retrieve regardless of the type of water, limiting the number of fish they could hook if they fished the spoon in the correct fashion for each water type. Choosing a spoon ... this can be as difficult as picking a Baskin-Robbins flavor! Spoons come in a variety of finishes, sizes, and shapes (oval, teardrop, elongated, etc). Finish choice follows selection of spinners: gold and silver in higher flows; brass, copper, and black finishes in clear water. Size and shape depend upon the depth and speed of water you plan on fishing. Most popular for both salmon and steelhead are sizes in the 3/8 to 5/8 ounce range. Shapes depend upon the speed and depth of the water you'll be fishing. Wider spoons such as teardrops (stee-lees are an example) create more lift and are often chosen for fishing in shallower water. On the other hand, wide spoons don't require a lot of water flowing over the body of the lure to impart their action ... so they are often a wise choice in deeper slower areas (especially for salmon) where maximum action at the slowest retrieve rate is desirable. 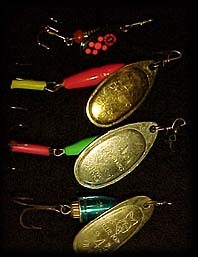 An assortment of spoons that you might find in an angler's vest. Thinner bodied spoons (such as the crocodile) sink fast and impart good action under faster flows ... making them a popular choice for the deeper runs in which many winter-run steelhead are found. You'll find that carrying an assortment of sizes and shapes is important if you plan on fishing a number of different holes with spoons ... find the combination of weight and shape that seems to get you down to the bottom the best without sacrificing action. Fishing the spoon is not much different from properly presenting a spinner or a driftrig. Casts are made across the current, varying from slightly upstream to slight;y downstream depending upon the current flow that you're working with. The objective is is swing the spoon across the current as close to the bottom as possible. You don't want the spoon spinning wildly, rather just a flip-flop motion. The amount you will need to reel will depend on how much current and depth you are dealing with ... try to avoid the mistake of simply casting and reeling ... you'll catch many more fishing swing the spoon in most instances. The diagram below is a rough guide to fishing the spoon. Spoons can also be effective in slower water when a retrieve is necessary to impart action. In these areas, reel just fast enough to keep the spoon working and off the bottom ... don't be afraid to alter the action every few feet. The takes, like any sort of hardware, will sometimes be vicious ... other times the spoon will simply seem to stop working ... pay close attention, sometimes it might be bottom, other times, it might be a fish! A longer rod will allow you to keep more line out of the water, allowing you to slow down the overall speed of the swing ... a good thing when it comes to hooking more fish. Heavier line causes the drift to speed up, use as light as line as you are comfortable with ... we normally use 12 lb. test. If you find that you can't get close to bottom, or that the spoon or spinner 'works' too hard in the current, move on! Not all water is suited to spinner and spoon fishing! Swinging spoons into a deep slot nearest you in the river and holding them in the current downstream is an excellent way to work these hard to fish areas for steelies! Be very patient ... although the basic concept is easy ... mastering the touch needed to keep a piece of hardware slowly and on the bottom takes LOTS of practice!! !